When you think about acne prevention, finding the perfect combo of face wash and exfoliator or keeping your makeup brushes clean might come to mind. But what if your acne isn’t caused by a lack of hygiene, but by an unhealthy diet, specifically one that’s high in processed sugar? Can sugar cause acne, even if you are keeping your face clean? Can eating too much sugar cause diabetes? Click here to learn the facts. The following information explains how a high-sugar diet could be affecting your skin from the inside out and causing those pesky breakouts. Eating too many processed sugars can lead to a rise in insulin levels in the body, which can cause inflammation. This inflammation can potentially lead to a plethora of problems, and a few of them are acne and a noticeable redness in the skin, or rosacea, which can make acne more visible. Refined sugars can also slow down your body’s process of delivering important nutrients to your skin and removing waste and acne-causing bacteria. As a result, your pores may become more clogged than usual, and you might start to notice more pimples. In addition, a high-sugar diet can cause your skin to simultaneously become drier and produce too much sebum, which is an oil your skin produces naturally but can clog pores and cause acne if there is an excessive amount. Turns out, your sweet tooth isn’t the only thing that could be contributing to your acne; simple carbs that you might not consider to be sweet can also wreak havoc on your skin. Foods like cookies or cake do contain problematic refined sugars, but foods that contain a ton of simple carbohydrates like pizza and white bread can have similar consequences. These foods can cause inflammation like refined sugar does, which leads to the same breakout-producing effects. What’s more, refined sugars are often in foods that you least expect them to be, so next time you head to the grocery store don’t forget to read the ingredients and check the sugar content of the product you’re buying. 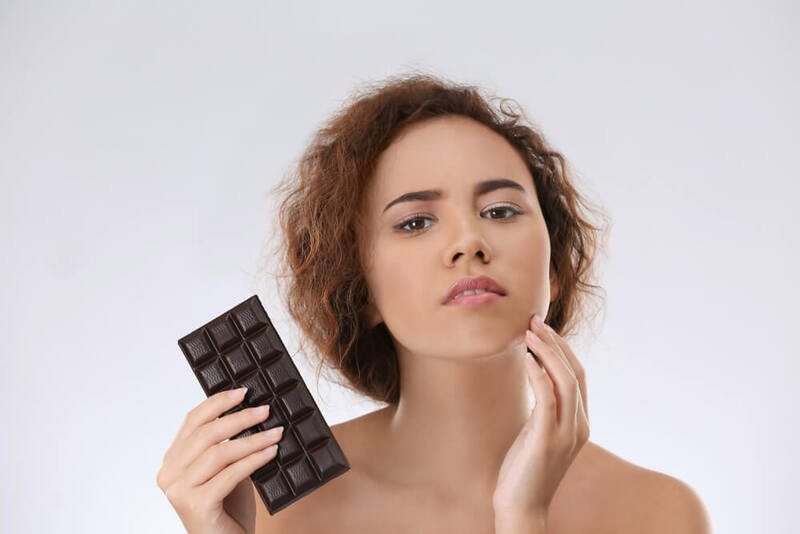 Acne is a short-term effect that sugar can have on your skin, but there are also some pretty detrimental long-term effects that might be lessening the effectiveness of your current skincare routine. The inflammation caused by refined sugar breaks down elastin and collagen, tissues that make your skin appear young and healthy. A lack of elastin and collagen can cause wrinkles to form and make your face look more aged overall. Keep in mind that simple carbohydrates are the ones you should try to stay away from if you’re trying to eat nutritious meals and clear up your skin, but complex carbohydrates are totally okay to include in your anti-acne diet. Foods rich in complex carbohydrates include vegetables and brown rice. Since they get broken down by the body into glucose slowly rather than quickly as sugar does, they don’t cause insulin spikes or breakouts. Overall, foods that have added sugar usually aren’t the best for your skin, but healthy foods that contain natural sugars, like apples and other fruits, aren’t going to have the same pore-clogging effects. If you’re looking to repair the damage done by a high-sugar diet, try eating more anti-inflammatory foods full of protein and beneficial fats. Omega-3 fats, for example, are known to keep your skin clear and smooth. You can find them in foods like olive oil and salmon. Besides a high-sugar diet, other lifestyle factors such as high stress or a lack of sleep can cause breakouts in the same way that processed sugars can, all because of a spike in your insulin levels. So, developing a well-rounded lifestyle in addition to a healthy diet is vital for keeping those annoying breakouts away. While finding products that work for you is an essential part of having great skin, consider maintaining a healthy diet with minimal processed sugars a part of your skincare routine. Taking care of your body by filling it with the right nutrients not only helps you feel better on the inside but look great on the outside, too.